Thank you for your review of this manuscript. Your review is an important part of the publication process. Serving as a reviewer is a time consuming and often thankless job. Please be assured that your help is appreciated. I'm excited to say that in March I will start part time as a statistical consultant in the CALS stat consulting lab. Find the form to sign up for a consultation here :) . Unfortunately, I wasn't able to attend the conference, so Phil presented my poster for me. I was standing by to video chat with anyone interested, but there were no takers :(. A few reporters were interested - one even called me later to ask some questions. But I don't think any story will come of it. Still, it was very neat to share my work with a large audience. Find a larger image here: Urban shade trees may be an atmospheric carbon source for much of the US. 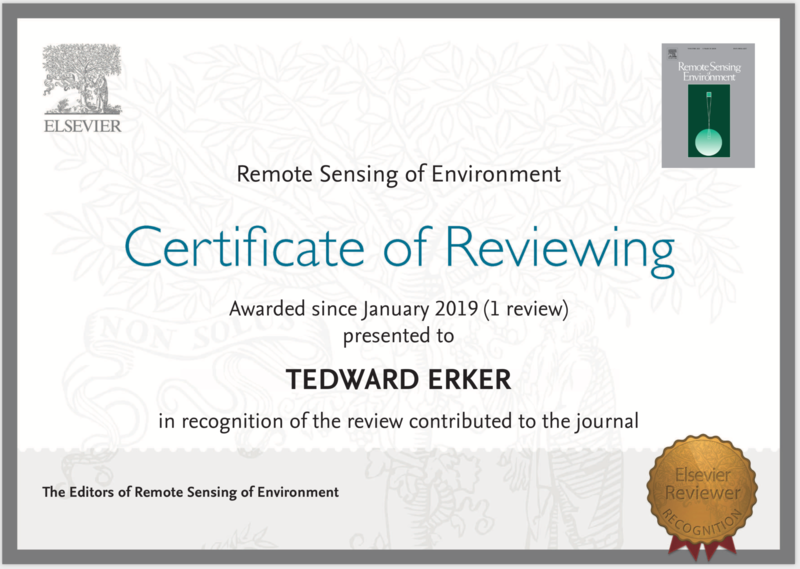 This work is now in review at Environmental Research Letters. I made these to illustrate the patterns of shade that trees provide to houses throughout the year at the latitude of Madison, WI. Today I defended my biometry MS project (presentation here). It felt good to be recognized for all the learning I've done in the past many years. I am now officially a master of science. Now back to work on my PhD. This week I participated in a National Socio-Environmental Synthesis Center (SESYNC) pursuit workshop. Drs. Lea Johnson and Michelle Johnson brought together a team of around a dozen or so social scientists, natural scientists and managers to plan a study of urban forest patches in Chicago and the Megalopolis of the east coast (Washington D.C., Baltimore, Philidelphia, and NYC). It was an amazing experience to meet people from all over who are as interested in urban trees as I am. We had loads of constructive discussion and I'm excited for the follow-up workshops in 2019. 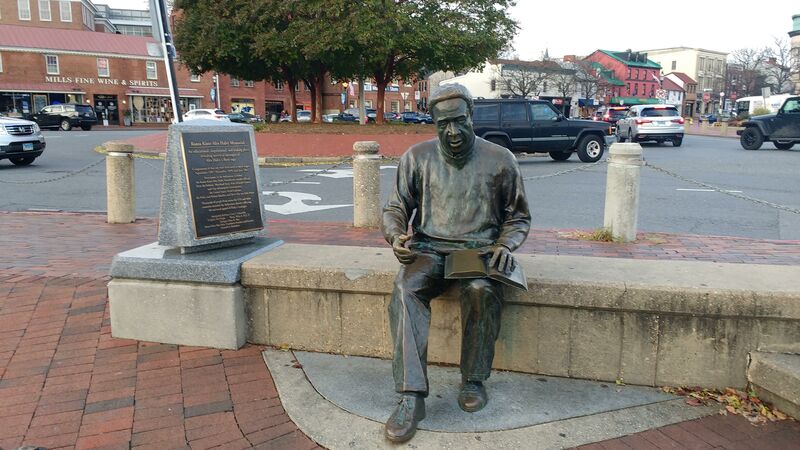 Figure 5: The Alex Haley memorial in the harbor of Annapolis. 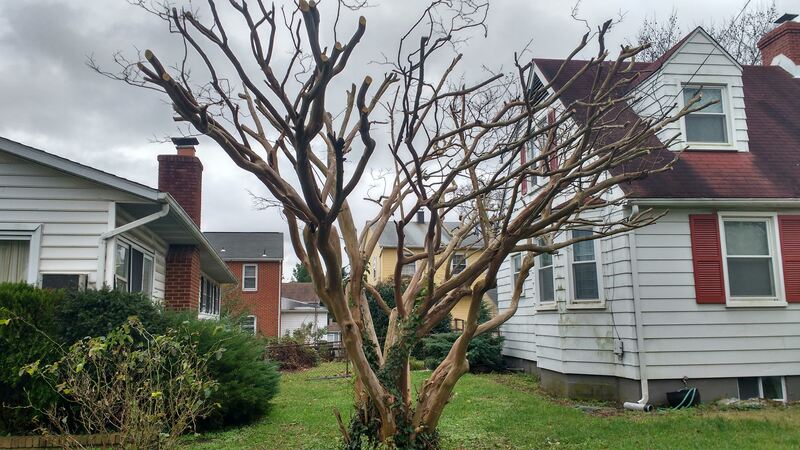 Figure 6: A pruned crepe myrtle. These heavily pruned trees have been causing some interesting problems in my work to develop growth equations for urban trees. We don't have them in cold Wisconsin, so I was super excited to see one with my own eyes. (Code for these and the below figures is in this repository). 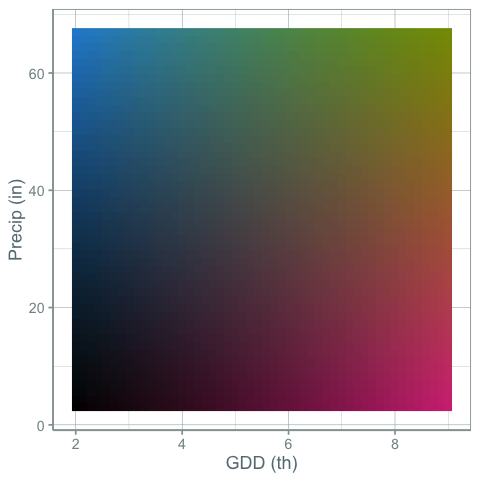 Figure 8: A 2-dimensional color palette. 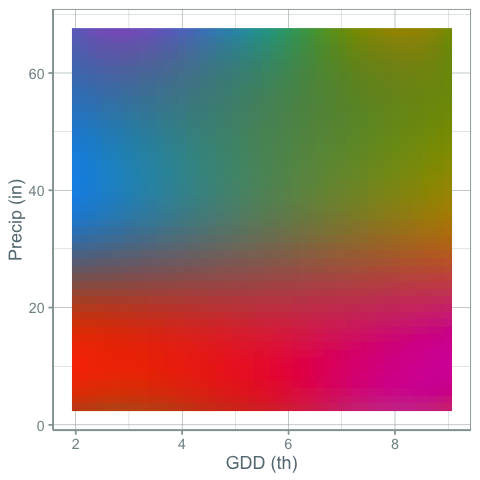 Figure 9: Weather stations colored by growing degree days and precipitation using the above palette. 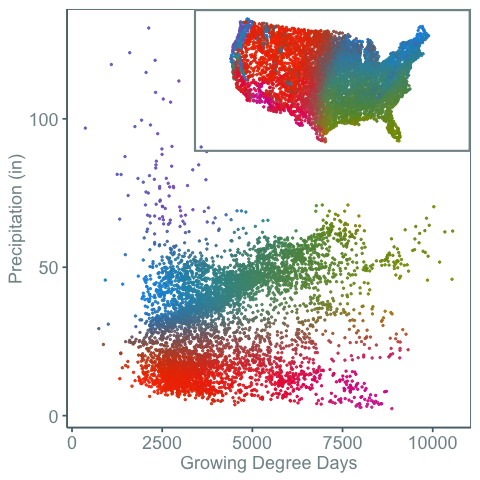 Figure 11: Weather stations colored by growing degree days and precipitation using the more complex palette. While this palette is more of a mess of colors and the gradients may break some rules about how palettes should be made to maximize a person's ability to accurately compare of values, I find it more informative. 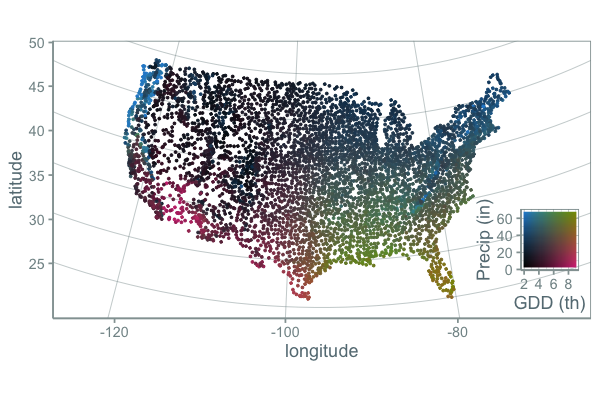 It is clear that the variation of gdd and precip across the US is a continuous gradient, but clear climate lines break out in places you might expect. One problem with this approach is that there are actually many weather stations with precip greater than 60 inches per year and other stations that fall outside of the scale. What ggplot does by default in these cases is it turns these points grey, which is what I probably should have done. But instead I assigned these points the closest color because I was more interested in general patterns (high, medium, low) rather than the specific number. 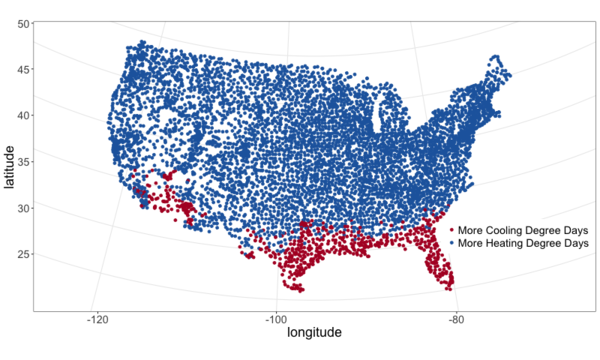 Here the weather stations are plotted in climate space and geographic space. Color then connects the two. This shows that the purple colored weather stations can have very high precipitation levels. 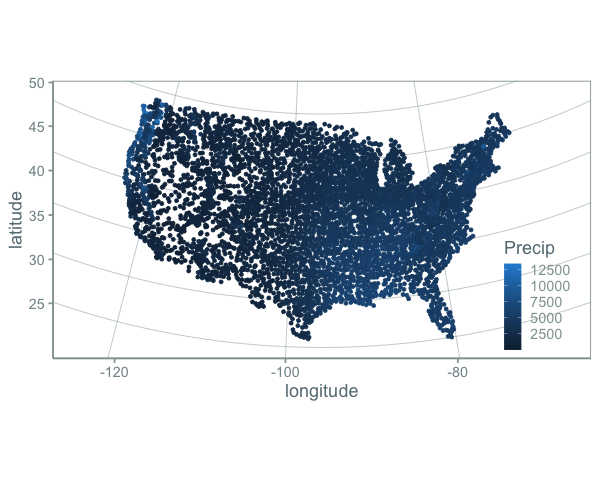 It also shows how weather spaces are distributed in both climate and geographic space. Say you want to take a look at all the papers that cite a paper. You do a search, then click the "cited by" link. Now you can see all the papers that cited this one. Pretty neat. How can you get the results into a table that you can add notes to? The results aren't all on a single page. So you need to give a vector of page urls. Copy and paste the first and second page. By changing the number after "start=" in the second url, you can get the remaining pages. Error in open.connection(x, "rb") : HTTP error 503. Google prevents massive automatic downloads for good reason. This code is meant to prevent the manual typing of page results into a table, not meant to scrape hundreds of results. Madison, where I live now, is a cold city, especially when compared to my hometown St. Louis. Lake ice in Madison is measured in feet. Ice of any thickness on the man-made ponds of St. Louis is an ephemeral phenonmenon and ice of a few inches thick, a bygone memory from childhood. The summers of Madison are also cool. I used to complain after I left St. Louis that midnight summer bike rides in Madison lack something critical: the stored day's heat radiating off the asphalt and into your skin as you ride through a blanket of humidity. But, as I write this, I'm sweating on my front porch. It doesn't feel like I live in a cold city today. For something related to my work, I was curious how Madison compared not just to St. Louis, but also to the rest of the country. What percent of Americans live in a climate that is as cold or colder than Madison? Where is the boundary between a "hot" and a "cold" city? And what percent of Americans live in cold places? hot places? One way to measure this is with heating and cooling degree days. These are basically a measure of how much a place deviates from a balmy temperature, say 65 degrees farenheit. Cold places have more heating degree days (days when you need to turn on the heat) and hot places have more cooling degree days (days when you need to turn on the A/C). I pulled climate data from NOAA and plotted it below. See this github repo for code. 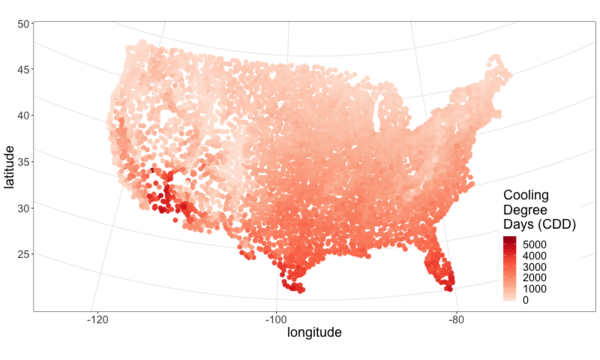 Figure 14: Heating Degree Days at weather stations across the continental U.S. The north and mountains are cold. 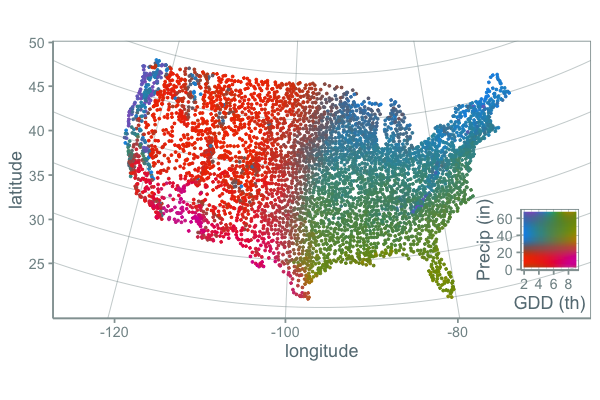 Figure 15: Cooling Degree Days at weather stations across the continental U.S. The mojave desert and the south are hot. Figure 17: The difference between the number of heating and cooling degree days. A more continous version of Figure 16. From the above maps it's pretty clear that most of the continental U.S. is heating dominated (cold). This isn't surprising, but it is neat to visualize and moves us closer to an approximation of what percent of Americans live in a heating or cooling dominated area. To answer that we need population data. I joined census tract data with HDD and CDD based off the closest weather station to the tract's centroid (more code here). Figure 18 plots the population in HDD and CDD space, using hexagon bins to prevent overplotting. The 1:1 line separates places that have more CDD than HDD from those that have more HDD than CDD. slightly more than 3 out of every 4 Americans (77%) live in a heating dominated climate. 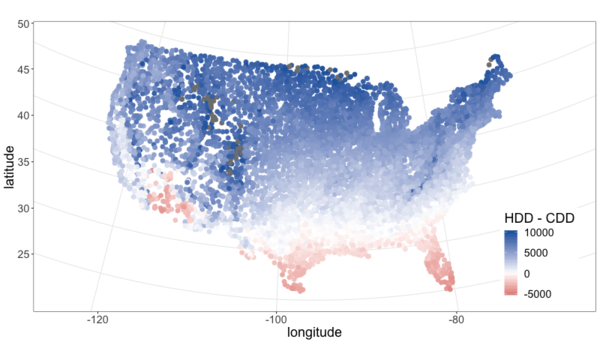 Madison is a lot colder than most of the U.S.
California, especially southern, is an exception to the strong inverse relationship between HDD and CDD across most of the country. They are not really hot and not really cold. Figure 18: U.S. population in heating and cooling degree space. This figures adds to Figure 17 because it also shows mild places and the inverse relationship between HDD and CDD. It can be a little hard to see the city names. Looking for a more clear figure or curious where your city falls in cooling and heating degree space? 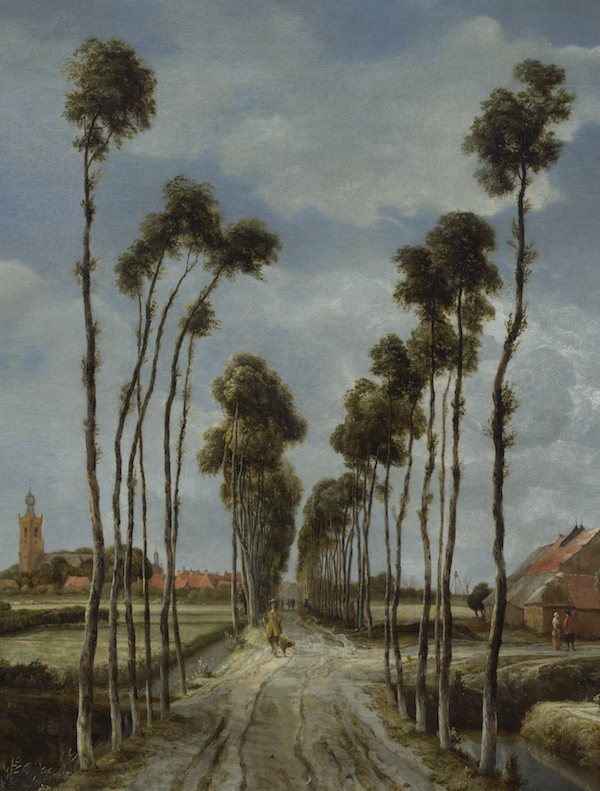 How the landscape can be transfigured is seen by Hobbema's painting, which has been one of the world's favourites for more than two hundred years, "The Avenue at Middelharnis, Holland." Figure 22: An even earlier example of a street lined with trees. 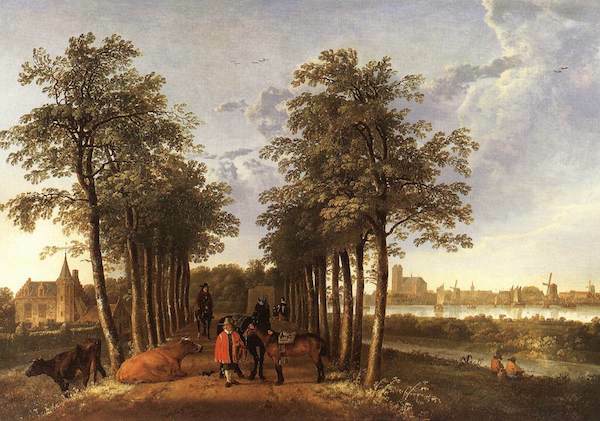 The Avenue at Meerdervoort, Aelbert Cuyp, 1650-1652. I had long thought that those who planted trees along streets back in the day only considered planting monocultures. Indeed, many authors take it as a given that this is the preferred, more beautiful way. Only recently with the repeated loss of popular species did I think this idea was being commonly challenged and even then, there are many who prefer monocultures for ease of management. Then I found this article from volume 8 of Scientific American, 1852, and I realized that the desire for a diverse street goes way back. Our people are too liable to go everything by fashionable excitements, instead of individual independent taste. This is the reason why whole avenues of one kind of tree may be seen in one place, and whole avenues of a different kind in another place; and how at one time one kind of tree, only, will be in demand, and at another period a different tree will be the only one in demand. We like to see variety; and the ailanthus is a beautiful, suitable, and excellent tree to give a chequered air of beauty to the scene. We do not like to see any street lined and shaded with only one kind of tree; we like to see the maple, whitewood, mountain ash, horse-chestnut, ailanthus, &c., mingled in harmonious rows. It's an interesting list of species too. I'm not sure what whitewood is, maybe Tilia? Moutain ash, horse-chestnut, and ailanthus are still around but rarely planted as street trees. 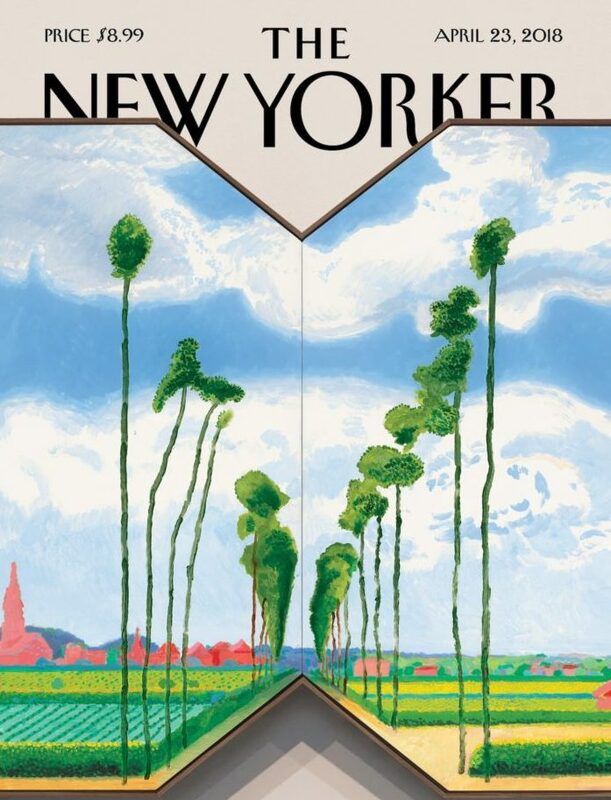 Crazy coincidence that the New Yorker's April 2018 cover is based on a work by David Hockney which is based on the "Avenue at Middelharnis". Figure 24: See, people still like trees of the same type all in a row. Unfortunately, there are a limited number of tree species adapted to the harsh growing conditions found in many cities, a fact lamented early in the last century (Solotaroff 1911) and repeated to the present day. After reading this I immediately had the desire to cite somebody from over 100 years ago. Like the author who pulls quotes from Horace to show our unchanging human condition across millennia, I wanted to find my Odes so that I could uncover the ancients' connection to city trees and determine if it was like my own. How did they view their trees and are we different today? And then I went down a little history rabbit hole. I checked out solotaroff_1911 from the library and quickly realized how some things have changed enormously (public enemy number one of street trees is no longer the horse), while others (the trees themselves) are the same. The book is filled with great photos of tree lined streets, meant to exemplify the beauty of a monospecific street and highlight each species' characteristics (Figure 25). 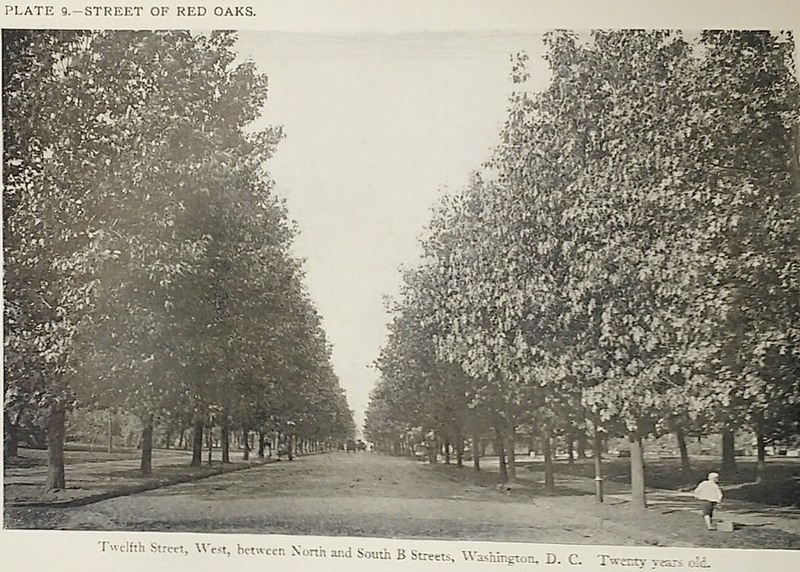 Figure 25: Plate 9 - Street of Red Oaks from Solotaroff 1911. I love the little boy in the bottom right. Original Text: Twelfth Street, West, between North and South B Streets, Washington, D. C. Twenty years old. I searched for these streets on google street view, to see if the trees survived the century. The few streets I checked before becoming discouraged were radically transformed and the trees were gone. Most had changed with development. 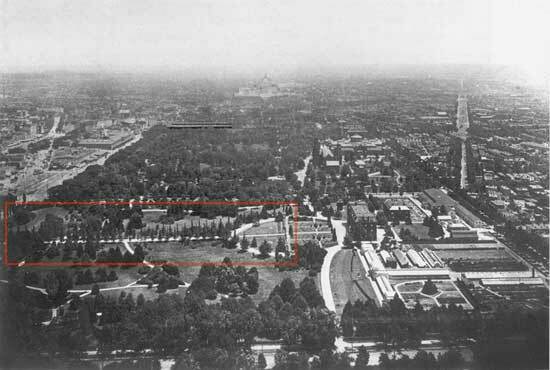 Some were located on what would become the national mall and McMillan's plan removed them. However, with gingkos I did have luck. Figure 26 from Solotaroff shows a block of 30 year old gingkos. 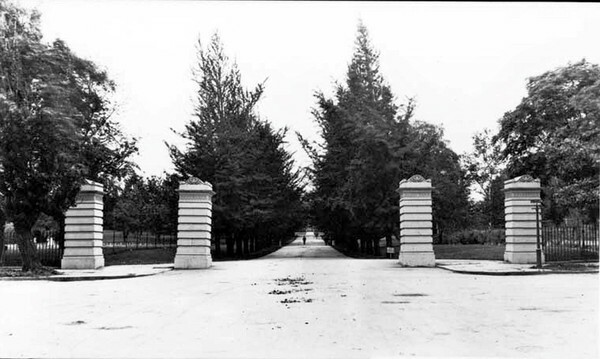 Figure 26: Gingkos in 1911. 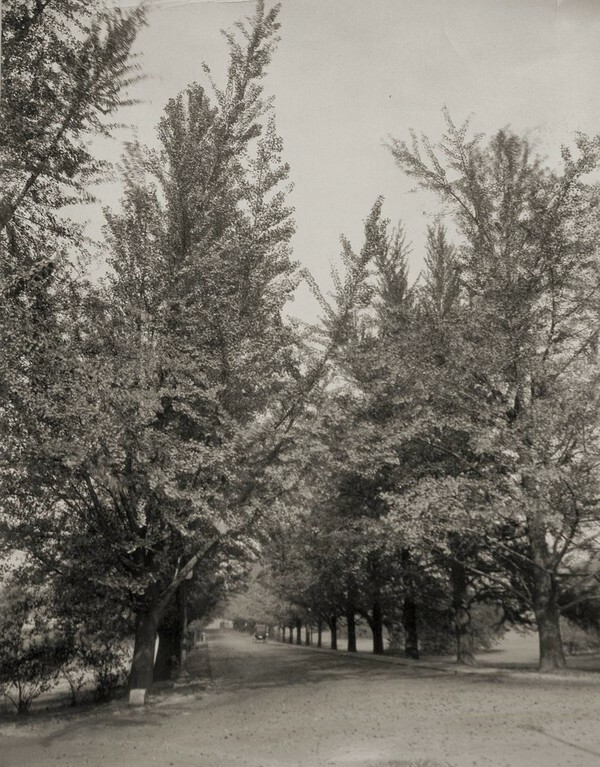 Original Caption from Solotaroff: Street of Gingkos, leading from the grounds of the United States Department of Agriculture, Washington, D.C. Thirty years old. With some searching, I found this article about George Saunders on the USDA website. 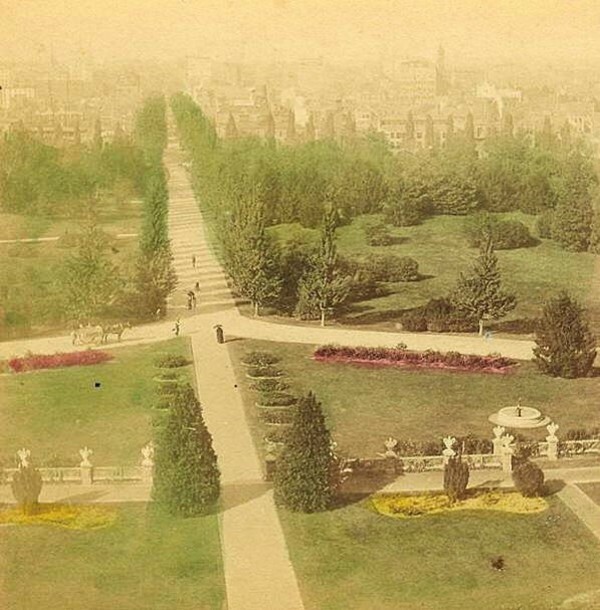 Saunders was responsible for the planting of the gingkos around 1870 (Figure 27). 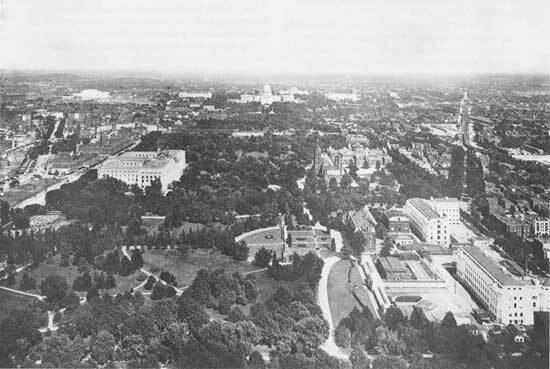 I also found two photos (I think taken from the Washington Monument), overlooking the mall in 1901 and 1908 in which the ginkgos are visible (Figures 28 and 29). 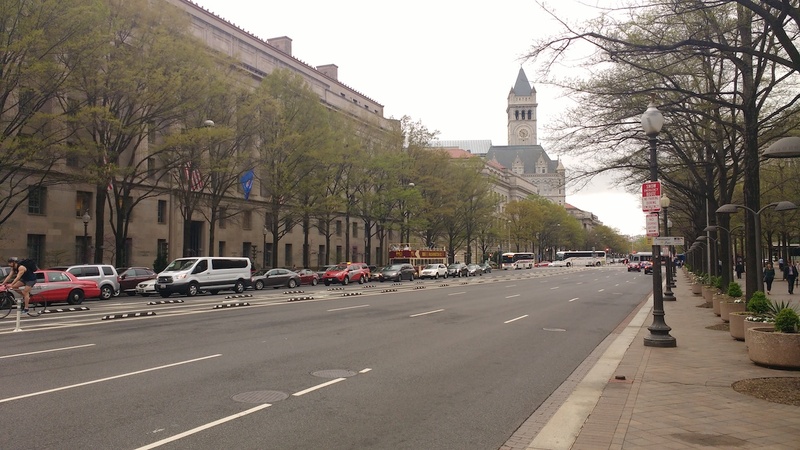 Today, even though the USDA building is now gone, two of the original trees are still around (Figure 30). 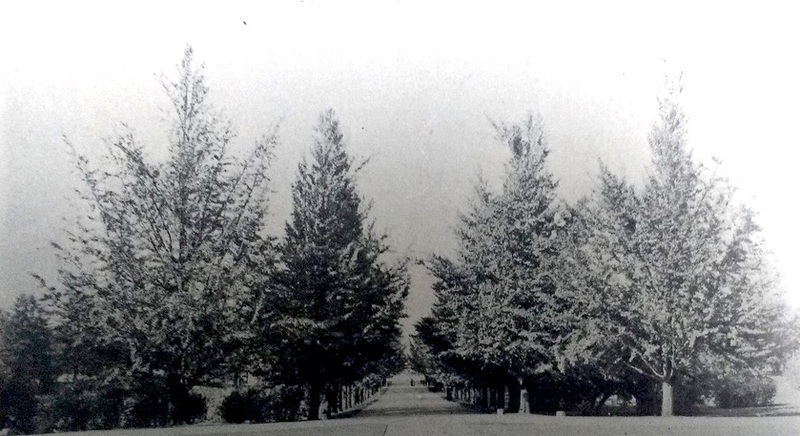 Figure 27: Two rows of gingkos planted circa 1870. 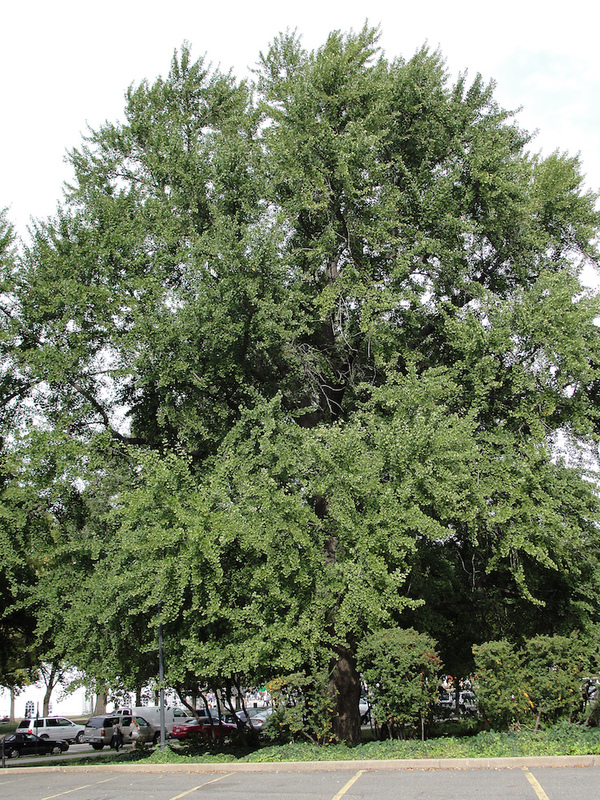 Figure 30: One of the surviving gingkos, on the northwest side of the Whitten Building, 2013. Photo by Robert Griesbach. They are a little bit of living history. Their survival to a mature age in such a large city certainly required a lot of people making decisions to spare them during development. Next time I go to D.C. 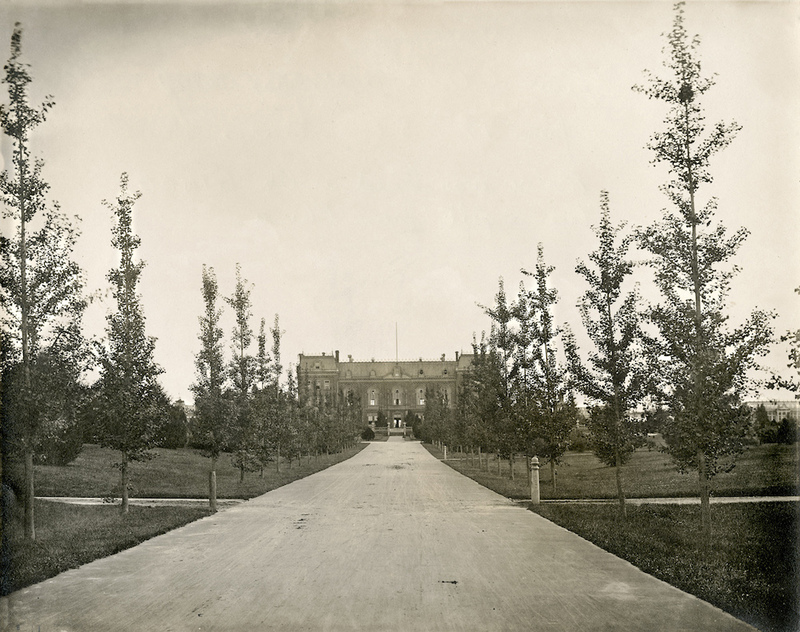 I have a scavenger hunt planned out to see if any of the other trees Solotaroff photographed in 1911 are still around today, or if the only survivor is the hearty ginkgo. Say you plant a tree in a city. How big will it be in 20 years? You might want to know because the ecosystem services provided by trees is largely a function of their size - the amount of carbon stored in their wood, the amount of shade and evapotranspiration providing cooling, the amount of leaf area reducing sound and air pollution. Below is the quadratic function to predict diameter at breast height (DBH) from age. where ε is the error term. See the best fitting quadratic relationship between age and DBH for Tilia americana below. This quadratic function does a good job describing how dbh changes with age (better than any other form they tested). They found the quadratic curve gave the best fit, but unfortunately the curve predicts that DBH begins declining at old age, something we know isn't true. Diameter should increase monotonically with age. The trouble is that for old trees, the number of samples is small and the variance/error is large. A small random sample can cause the best fitting curve to be decreasing, when we know that if we had more data this wouldn't be the case. If we constrain the curve to be non decreasing over the range of the data, we can be almost certain to decrease the prediction error for new data. The function lsei in the R package limSolve uses quadratic programming to find the solution that minimizes the sum of squared error subject to the constraint. I don't know the math behind this, but it is very neat. This stats.stackoverflow question and the limSolve vignette helped me figure this out. The constrained curve looks pretty good. Just a quick note about using lsei, the signs are not what I expected them to be in the G matrix. Maybe my math is wrong somewhere or I don't fully understand the limSolve package. According to my equation above the G matrix should have negative values, but the solution is correct, so I'm going to go with that. If you read this and find my error, please tell me. Even after constraining the quadratic curve to be increasing over the range of data, it's still not ideal. Extrapolation will certainly give bad predictions because the curve begins decreasing. The quadratic curve is nice because it is simple and easy and fits the data well, but it is probably better to select a model form that is grounded in the extensive knowledge we have of how trees grow. The goal of the urban tree database to create equations specific to urban trees which may have different growth parameters than trees found in forests. But the basic physiology governing tree growth is the same regardless of where the tree is growing, and it makes sense to use a model form that considers this physiology, like something from here. Even if I won't use this, I'm happy to have learned how to perform a regression with a somewhat complex constraint on the parameters. [2018-05-18 Fri] Update: I found out QP is a pretty standard thing in linear algebra and that it's used to connect splines. Neat. The best way to get to work is by ice. Stan is a probabilistic programming language used for bayesian statistical inference. I got a student scholarship to attend the Stan conference 2018 in Monterey this January. My personal highlight of the conference was meeting and chatting with other attendees at family style meals. It is truly amazing the variety of fields in which Stan is used. I had many productive and enlightening conversations. R packages rstanarm and brms can help you fit Stan models using R syntax many people may be more comfortable with, such as the lme4 syntax for multilevel models. They can also output the stan code for tweaking. Fitting customized hierarchical models can be challenging in Stan for a non expert like me. But the flexibility of these models is attractive. The regularized horseshoe prior is an option for shrinking parameter estimates. I'd like to test it out for some of the problems our lab faces. I don't think it would provide predictive improvements, but it might enhance inference by identifying important variables. "Our work is unimportant." Andrew Gelman, the lead of the Stan team and final speaker, emphasized this point, that bayesian inference hasn't done much for humanity. It was a humbling and thought-provoking comment to end three days of talking about all the things that we use Stan for. It was a good point for reflection and a reminder that I need to balance my compulsions to do technically correct/advanced/obtuse science with my desire to do science that actually gets done and contributes to society. Gelman also mentioned that our work can be like a ladder: Scientists must become statisticians to do science, statisticians must become computational statisticians to do statistics, computational statisticians must become software developers … and so on. As a scientist who constantly feels like he's in over his head with statistics, I appreciated this point. To achieve our objectives we must stretch ourselves. It's never comfortable to feel like we don't know what we are doing, but how else can we grow? Figure 48: Flying home: Mountains in Utah. Incredible. We flew over the most incredible canyon too. I wish I knew where it was so I could visit on foot. Statistics can be a powerful tool for identifying fraud in elections. One of my favorite examples comes from the 2011 Russian election. See the wikipedia article and this figure. The distribution of the votes has very abnormal peaks at every 5%. The Honduran election that just happened is also suspect to fraud and the economist did a quick analysis to test for any sign of interference in the voting. Check out their article here for the details. But the gist of their work investigates changes in the distribution of voting from one day to the next, with the premise being that Hernández's party saw they were losing and stuffed the ballots near the end of voting. I'm curious to see what comes of this. To me it seems like a recount is in order. Maybe statistics is not that helpful. The U.S. recognizes Hernández as president despite the irregularities. See the wikipedia article. Perhaps statistics can identify a problem with a certain level of confidence, but it cannot solve that problem. These two cases are disappointing, and I'm curious if there are elections where fraud was identified with statistics and this revelation led to a redo. One of the fun parts of my work this semester was knocking on doors and asking people when nearby trees were removed. We wanted to see if the removal of the trees affected the area's air temperature. The residents were super helpful and many gave us very precise and accurate dates for when trees were removed, especially for trees from their own yards. However, many were not sure about street tree removals and so we double checked dates with city Forester's records. (A big thanks goes to to Robi Phetteplace, Marla Eddy and Brittany Prosser for helping with this!) When I did the double checking, I was surprised at how far off many of the resident's guesses were. Below is a table which shows that a resident's best guess of when a street tree was removed is usually off by several months, even when the removal happened recently. Probably most surprising was a resident who, when asked about a tree, said that no tree ever existed there. On the other side of the memory spectrum, there was one resident, Sara S, who could exactly date when a tree was removed because she had photo evidence and a good story. Minutes before a hail storm blew through, she told her daughter to move her car inside. Shortly after, the tree the car was parked under split in half. It was removed the next day. I think the insight to be gained from these informal observations is that people don't remember things unless they are important to them. Even though we see these trees everyday, they aren't important enough for us to remember when they go away. But I'm not judging, I can't even remember my good friend's birthdays, so why should I expect people to be able to recall when a tree was removed? Our memories just aren't so good, and it's important to remember that when doing research. This is a beautiful flyer created by Cheyenne to leave on the doors of houses who don't answer when we knock to find out when a nearby tree was removed. As of today we've had a couple responses that have given us the exact date trees were removed. Thank you Sara Sandberg and Mike Bussan! I got to help students in Madison East's AP Environmental studies on their field trip to the Madison School Forest. With 85 students and just one teacher, it was a big undertaking, but their teacher, Angie Wilcox-Hull, did an awesome job organizing. Students realized that we used the equation of a cylindar to approximate the volume of a tree, but a cone is usually more appropriate. When we talked about finding the volume of wood in leaning trees, one student used his knowledge of calculus to tell me it wasn't quite so hard. See here. I wonder if foresters use that idea for leaning trees. While we measured individual trees, carbon stored per area of land may be more interesting for managers. I use the foreach and doParallel packages in R to speed up my work that can be easily parallelized. However, sometimes work can't be easily parallelized and things are slower than I'd like. An example of this might be fitting a single very large and complex model. Andy Finley, who resently stopped by UW-Madison to give a workshop on hierarchical modeling, taught us about OpenBLAS as a way to speed up matrix operations in R. Here are the notes about computing from the workshop. BLAS is Basic Linear Algebra Subprograms. R and other higher level languages call BLAS to do matrix operations. There are other versions of BLAS, such as OpenBLAS, which are faster than the default BLAS that comes with R because they are able to take advantage of multiple cores in a machine. This is the extent of my knowledge on the topic. Below is how I installed OpenBLAS locally on our linux server and pointed R to use the OpenBLAS instead of its default BLAS. A benchmark test follows. I copied how to do this benchmark test from here. The benchmark test time was cut from about 146 to about 38 seconds on our server. This is a very significant speed up. Thank you OpenBLAS and Andy Finley. From comments here, I have heard that OpenBLAS doesn't play well with foreach and doParallel. I will have to test these next. If it is an issue, I may have to include a shell code chunk in a literate program to change between BLAS libraries. I just applied to the CASE 2017 Workshop in Washington, DC. The application process led to some interesting thoughts, so I thought I'd share the essay. Update [2017-03-09 Thu]: I was not accepted. "How do we know the earth is 4.5 billion years old?" I loved asking my students this question when I taught high school science. The students (and I) were hard pressed to explain how we know this to be true. Most of us don't have the time to fully understand radiometric dating, let alone collect our own data from meteorites to verify the earth's age. So unless it's a topic we can investigate ourselves, we must simply trust that scientists are following the scientific method and evaluate their results within the context of our own experience. Trust between scientists and the public is therefore the necessary foundation upon which our society accepts scientific research, incorporates it into policy, and supports more science. 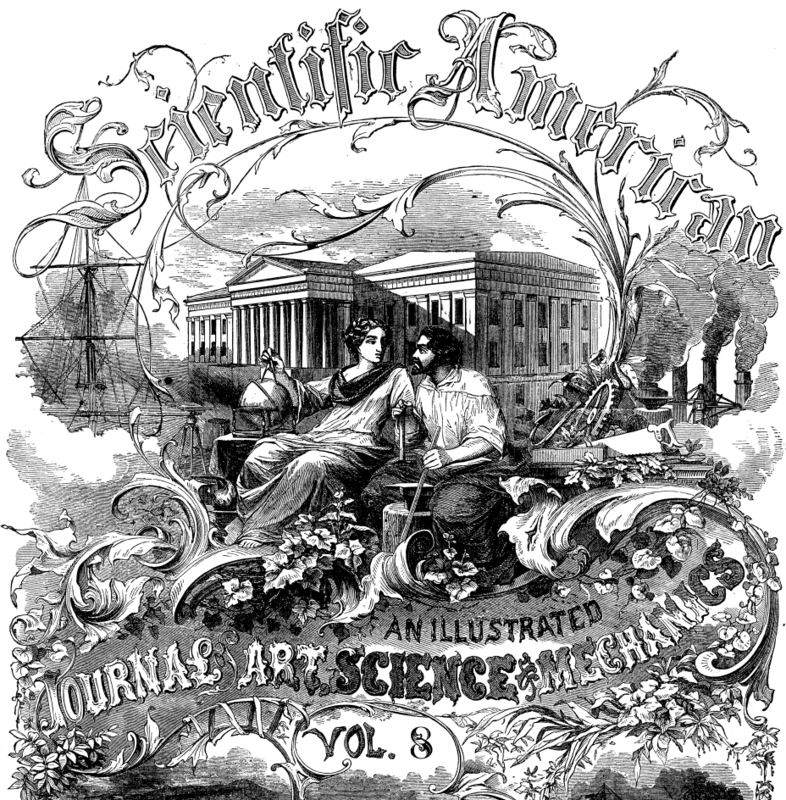 The communication of science's benefits to society maintains this trust. Unfortunately, the public and scientists disagree in many critical areas of research, such as genetic modification, climate change, evolution, vaccinations, and the age of the earth (1) (2). I believe scientists must do more to directly address these discrepancies. 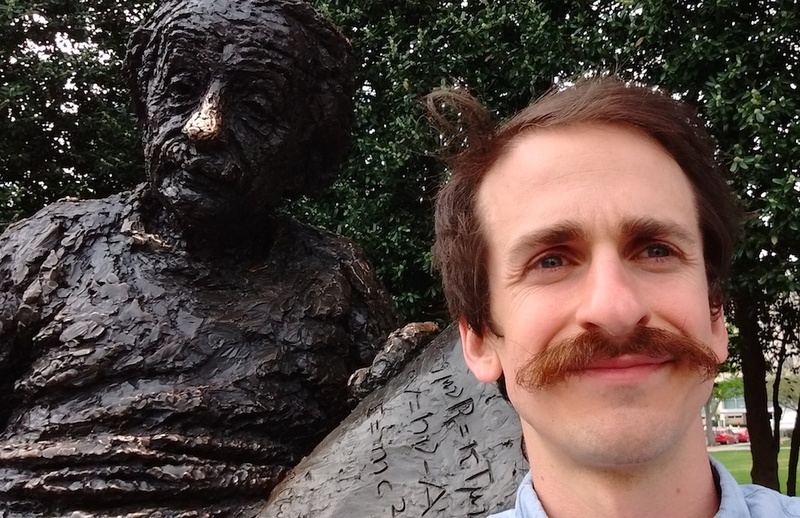 As a scientist I have the incredible opportunity to conduct research that I think will improve society, and I'm honored that the public pays me to do it. I'm making a withdrawal from the bank of public trust and feel strongly that I need to pay it back with interest. I see scientific communication as the way to do so. Effective scientific communication goes way beyond publishing quality work in reputable journals and requires that we place our findings into the public consciousness. I have taught at the university and have led a few guest labs at an area high school, but I want to have a greater impact. The CASE 2017 workshop excites me with the opportunity to learn how to make this impact. My hope is that CASE will orient me to the landscape of science advocacy, policy, and communication. Despite benefiting from federal funds for science, I am mostly ignorant of how our nation allocates resources to research, and I look forward to CASE demystifying this process. I hope to learn effective methods to communicate science with the public and to discuss with elected officials the value of research for crafting smart policy. Because scientists understand their work best, they are best suited to advocate for it. CASE will provide a unique opportunity to learn how to be an advocate for science and a leader in strengthening the trust between the scientific community and the public whom we serve. If selected, I would like to work with the other selected graduate student and the graduate school's office of professional development to host a mini-workshop to bring the knowledge and skills from CASE to our campus. I'd like to replicate the Capitol Hill visits at a state level and work to get more graduate students engaged with elected officials from across the state. R is the language I use most often for my work. The spatial packages of R that I use very frequently like rgdal, rgeos, and gdalUtils depend on external software, namely gdal, proj4, and geos. Here I show how I installed gdal, proj4, and geos on chtc, and pointed the R packages to these so that they install correctly. The R part of this tutorial comes from chtc's website. Their site should be considered authoritative. I quote them heavily below. My effort here is to help people in the future (including myself) to install gdal etc. on chtc. I save it in a directory called "Learn_CHTC"
# If you wish to compile code, you'll need the below lines. #  Otherwise, LEAVE THEM OUT if you just want to interactively test! #  for "memory" and/or "cpus". change erker to your username and if you don't use submit-3, change that too. You'll have to be inside the directory that contains "interactive_BuildR.sub" for this to work. Each install is slightly different, but follows the same pattern. This worked for me on this date, but may not work in the future. unable to load shared object '/home/erker/R-3.2.5/library/rgdal/libs/rgdal. "configure: error: cannot run C compiled programs"
Change your vector of packages according to your needs. I created this image of Madison's lakes using hyperspectral imagery from NASA's AVIRIS sensor for the Cool Science Image Contest. I threw it together the week before the contest and was very pleased to be selected, but I wish that it had been more related to the science that I do. It is a minimum noise fraction transformation which is a way to transform/condense the data from the ~250 bands into the 3 visible channels (rgb) for maximum information viewing. Originally I intended to create an image over land, but had great difficulty getting the mosaicing of the 3 flightlines to be seamless. You can see the band across the northern part of lake Mendota from fox bluff to warner bay that is due to image processing, not something real in the water. The image is no doubt cool, but I wish I could say more what the colors meant (If you're a limnologist and see some meaning, please let me know). I think that pink may be related to sand, and green to bright reflections on the water. There's probably some algae detection going on too. My goal for next year is to make an image that is heavier on the science and still very cool. Field work provides the opportunity to be outside, help out on lab-wide projects, and to learn about new research that isn't exactly in my wheelhouse. September 8-10 I went to the north woods to help collect foliar samples as part of a NEON and Townsend lab project to ultimately predict foliar traits such as morphology, pigments, and other chemical constituents from hyperspectral imagery to create maps of these traits. This was the first year of a five year project. There's much more to the science behind the goal. But the aim of this post is not to explain all that, but rather, to share some images and the joy of being in the north woods. Figure 64: NEON's Flux Tower. Measuring the exhange of carbon between atmosphere and biosphere. Sweet. Flux tower of Ankur Desai's research group, much smaller than NEON's. Maples creating lovely dappled light. I use emacs org-mode as the core application for my research. It makes sense to use the great org publishing features to create a website without having to learn many new skills. I had considered using jekyll, but ultimately realized that I could make a website that is just as beautiful and functional with emacs org-mode. I've looked at tons of websites made with org-mode. I like Eric Schulte's best for an academic personal page, and I wanted to use the org-info.js for a blog with keyboard shortcuts for navigation and search. If you're not familiar with org mode, check it out. If you are already familiar with org mode, spend twenty minutes reading about exporting to html and publishing. The manual is pretty clear. Once you have a published webpage, check out some css stylesheets from other org sites that you like. Mine is a modified version of the stylesheet of eric schulte, who I asked permission from to use. I spent no more than 3 hours setting up the site. Deciding that this was the approach I wanted to take and generating the content took a couple days. You can clone the github repo to see how I have it set up. It is great to be able to work on the content of the website in a very familiar way and export it to the internet with one command. Amazing. Use a sodium hydroxide solution with proper protection and ventilation. Be patient. Use rubber stoppers to block holes in frame (bottom bracket and water bottle braze-ons. My seatpost had been stuck in my steel frame for years. Fortunately it was at the proper height, so it didn't bother me. When my headset broke and needed to be replaced, I figured I'd take care of the seatpost at the same time. I wasted an incredible amount of time trying to remove the seatpost and ruined my paint in the process which required a costly repowdering. This post is to share my experience so that you don't have to go through the same thing. Tying it between two trees and trying to pull it apart with 3 men and a 6-1 mechanical advantage system. Stop up bottom bracket and braze-ons (any holes that will let the sodium hydroxide leak out of the seat tube) with rubber or cork stoppers. I got many of different sizes for less than a dollar at the hardware store. Add sodium hydroxide salt to water (not water to salt). I did this in an old milk jug. Sodium hydroxide is sold at your local hardware store as lye or drain cleaner. Check chemical composition to verify it is NaOH. I didn't measure the concentration of the solution that I used, but you don't want it to be so concentrated that it bubbles violently out of seat tube and destroys your paint. Also, the dissolving of NaOH is exothermic and the milk jug will get quite warm, or hot if it's very concentrated. Be patient. My seat post wall was quite thick, at least 2 mm. This will take a long time to dissolve. Wait until the solution is finished reacting with aluminum (you can hear the production of hydrogen gas), which may take a few hours. Then pour out the solution from your frame and dispose of the dark grey liquid (because I wasn't sure if the NaOH was completely used, I added vinegar in an attempt to neutralize the base). Repeat steps 5-7 until the post is completely dissolved or you can pull the post out. I had apex custom coating in Monona, WI repaint my frame. They did a great job and the price was lower than everywhere else I looked, but it still wasn't cheap. Don't let the NaOH stay on your frame long! [roads_1930] Roads Beautifying Association & others, Roadside planting, Country Life Limited (1930). [ball_e_2007] Ball, Mason, Kiesz, , McCormick & Brown, Assessing the Hazard of Emerald Ash Borer and Other Exotic Stressors To Community Forests, ARBORICULTURE AND URBAN FORESTRY, 33(5), 350 (2007). [solotaroff_1911] Solotaroff, Shade trees in towns and cities, (1911).